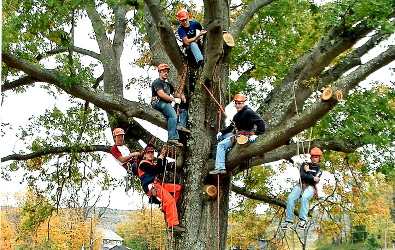 The Natural Resource Management program consists of a series of courses that will prepare a student for a career or further education in the fields of forestry, tree care, wildlife management, wood construction, and outdoor recreation management. Students will be involved in the principles and processes involved in the conservation, protection and/or improvement of our natural resources such as forest, water, soil, wildlife, and fish for economic and recreational purposes. Emphasis will be on forest and forestland management. 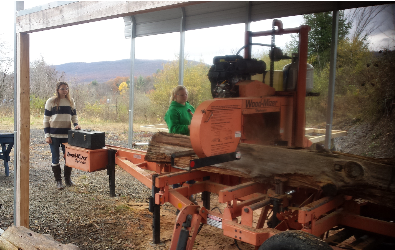 Hands-on experience is emphasized using a variety of equipment and resources such as a saw mill, chainsaws, wood working tools, and an outdoor forest and wetland laboratory. The Natural Resource Management program will challenge all students to their maximum competency level to achieve professionalism, career development, and transition to post-secondary institutions and/or the workforce. Students considering this program should posses a strong work ethic and a desire to improve and conserve our environment through responsible management of natural resources. 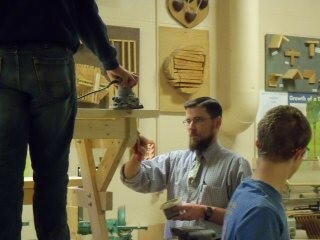 Except for NRM, all courses in this program are single period courses open to all 9-12 students. The NRM course is open to seniors who have completed or are currently taking all of the following courses: Wood Technology, Forestry, and Wildlife and Aquatics. A brief description of each course is provided below. Wood Technology: Students will learn to identify various types of lumber and their use based on the characteristics of the lumber. Students will use a variety of tools and techniques to plan and construct projects. Forestry: Students will learn the scientific principles used to manage trees in both the urban and forest environment for recreation and economic purposes. Wildlife and Aquatics: Students will study how wildlife and fish resources are managed to balance human needs and environmental concerns. NRM (Natural Resource Management): This course is a double period class reserved for senior students who have completed or are currently taking Wood Technology, Forestry, and Wildlife and Aquatics. Students in this course will manage a 14 acre woodlot as a multiple use site. 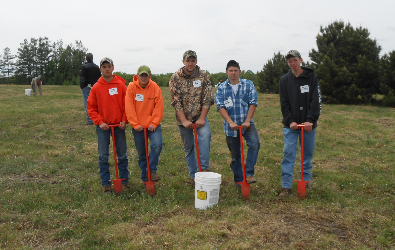 Students will conduct harvesting operations, mill lumber, construct recreational trails, climb and prune trees, and make habitat improvements for wildlife conservation. No matter where you live in Pennsylvania, you are not far from a beautiful forest. Our forests provide a multitude of products that we use in everyday life, an essential economic benefit to the Commonwealth, recreational and tourism opportunities, as well as providing habitat for wildlife (PA Forest Products Association, 2009). Pennsylvania is the largest producer of hardwoods in the country, accounting for 10% of the total hardwood output in the US. 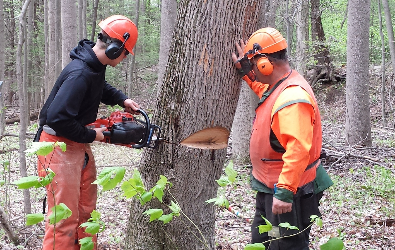 Revenues from Pennsylvania's forest products industry exceed $5.5 billion annually. Approximately 90,000 Pennsylvanians make a livelihood on the industry. Over 10% of the state's manufacturing workforce is involved in the forest products industry. There are over 3,000 separate businesses involved in the forest products industry, with a presence in every county of the Commonwealth. Every dollar paid to a timber owner for trees ultimately generates, through manufacturing, more than $17 worth of economic growth. More than half of Pennsylvania - about 17 million acres - is forest. Pennsylvania is blessed with a rich diversity of fish, wildlife, and plants. More than 10,000 species of plants and animals are known to exist in the Commonwealth. As inventory efforts continue, it is estimated that the total number of known plants and animals in Pennsylvania will reach 20,000 species. This diversity of species contributes to Pennsylvanians' well being by providing important recreational, economic, and biological benefits to the Commonwealth. Pennsylvanians rank first in the nation in time spent hunting and third in time spent wildlife watching. In 2001 (the most recent year for which data exists), about 1 million Pennsylvanians hunted, more than 1.2 million fished, and 3.7 million participated in wildlife recreation such as viewing, feeding, and photographing wildlife.